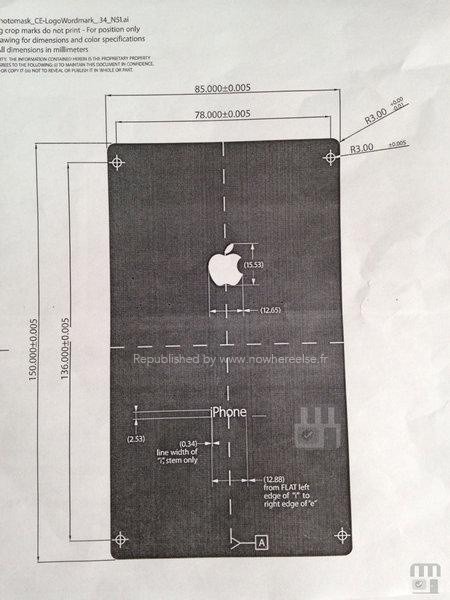 New coverage of the iPhone 6 is hitting the blogosphere on a daily basis now, and in the latest, we may have discovered the schematics of the upcoming device. Interestingly, the dimensions marked upon the drawing, throw everything we’ve heard so far into considerable doubt, with the measurements apparently pointing to a device with a ~5-inch display. Up until now, it has been suggested that there will be two different specifications of iPhone 6 – a smaller version packing a display of around 4.7 inches, and a larger model with a ~5.5-inch panel. Not only does this schematics leak indicate that there may only be one handset on the horizon, but the notion of what size its display will be is also up in the air. Nowhereelse.fr sourced the document from a Chinese website, so before we get too carried away, it’s important to note that this could easily have been faked. Moreover, even if it is legitimate, there’s no telling whether this is the actual iPhone 6, or merely a device that Apple has considered building and subsequently scrapped, so for now, we’re going to subscribe to the notion of two new models appearing later this year. One analyst has noted that the larger of the two new iPhones mightn’t hit the retail market this year, and given that a 5.5-inch iPhone would represent quite a significant departure from the current 4-inch display of the iPhone 5s, it wouldn’t be surprising if only the 4.7-inch model appeared later on this year. Manufacturers including Sharp and LG will reportedly begin making the new panels for the forthcoming device from next month, so as the parts leaks begin to surface, we should have a better idea of what’s in store. As was the case with LTE, Apple always takes its time when it comes to implementing new features, and while all of the market’s major OEMs have delivered a phablet device of some description, Tim Cook’s company has yet to bite. 2014 could well be the year that finally bucks the trend, and with several months until the supposed September release, we’ll undoubtedly be seeing plenty of leaks, rumors and other tidbits along the way. We’ll keep you updated on any new and intriguing iPhone 6-related info, so stay tuned!